Edgar Allan Poe (1809 – 1849) was an American writer who remains a towering figure in world literature due to his many contributions including that of creating the first recorded detective in the literary world; and being one of the earliest practitioners of the short story. 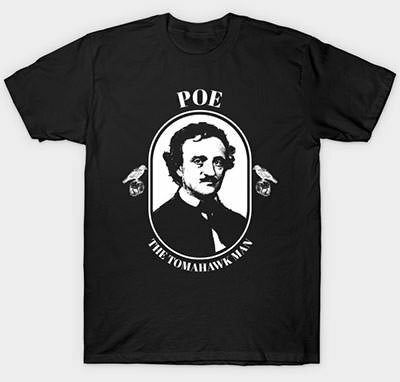 Poe was a controversial figure during his time due to his being a ruthless literary critic who wrote caustic reviews of literary works of other writers. Poe was able to achieve nationwide renown due to his poem The Raven but, despite being well known, he struggled financially throughout his life. There are many interesting facts related to Poe including his knack for cryptography; his publishing a hoax article; a mysterious man visiting his grave every January 19th; and a writer claiming that his ghost helped her in composing her poems. Know more about Edgar Allan Poe through these 10 interesting facts. During the time when Poe was trying to release his third collection of poetry which was simply titled Poems, he did not have any money to finance the publication. 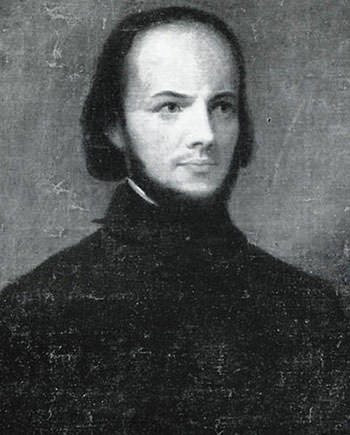 His fellow cadets at West Point, who held Poe’s writings in high regards, donated to the cause. Many of them even donated up to 75 cents each and Poe was able to raise a total of $170. Poe was known to pen down satirical verses about commanding officers during his time at West Point and his fellow comrades might have been expecting his book to be about the same. Poems was finally printed by Elam Bliss of New York and included a page that read “To the US Corps of Cadets this volume is respectfully dedicated”. Poe struggled financially throughout his life and even though he was ultimately able to achieve fame through his 1845 poem The Raven, his financial woes never ended. In August 1835, Poe was able to secure the position of editor of the Southern Literary Messenger in Richmond, Virginia. However, he was fired within the first few weeks, reportedly for being drunk on the job. He was reinstated later by Thomas W. White after promising good behavior. But Poe’s aggressive writing style, along with alcohol issues and his combative personality ultimately forced him to step down from Southern Literary Messenger in 1837. However, Poe later claimed that the circulation of the magazine increased 400% from 700 to 3500 during the time he was there. Poe went on to write for a number of other magazines and, in fact, during his lifetime he was mostly recognized as a literary critic. Poe had a reputation of being a cut-throat critic and his vicious reviews of the works of his contemporaries earned him the nickname of “Tomahawk Man”. 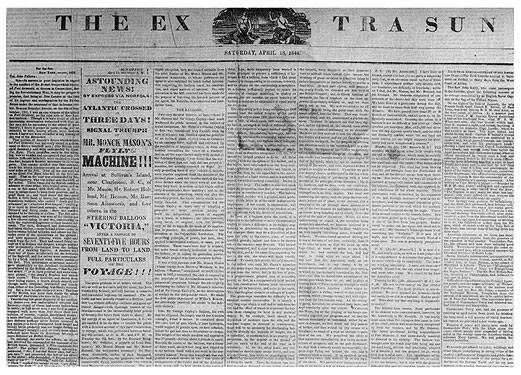 In 1844, after Poe moved to New York, he published a sensational news story in the New York Sun which is famously referred to as “The Balloon Hoax” by numerous anthologies today. In its original form, the article was presented as a true story and presented a detailed account of a lighter than air balloon trip undertaken by European Balloonist Monck Mason across the Atlantic Ocean. Poe claimed that the trip took only 75 hours and also presented diagrams and specifications of the craft. It was first published on April 13, 1844, and ran with the following headline: “ASTOUNDING NEWS! BY EXPRESS VIA NORFOLK: THE ATLANTIC CROSSED IN THREE DAYS! SIGNAL TRIUMPH OF MR. MONCK MASON’S FLYING MACHINE!! !” The Sun retracted the story within a couple of days, claiming the intelligence to be “erroneous”. With the publication in 1841 of his short story, The Murders in the Rue Morgue, Edgar Allan Poe is attributed with the creation of the first literary detective in the world. This is considered by many as the greatest achievement of Edgar Allan Poe. His character, named C. Auguste Dupin, displayed textbook traits and turned out to be a literary convention for countless stories and characters by other notable writers including Sherlock Holmes and Hercule Poirot. Poe himself referred to the story as one of his “tales of ratiocination”. In this regard, Poe built the much copied model that included an eccentric world-class detective, a close friend who also serves as the narrator, and how the final revelation is announced by the detective and subsequently explained to the reader. It is interesting to note that Poe created Dupin even before the word detective had been coined. Apart from The Murders in the Rue Morgue, Dupin also features in two more short stories by Poe titled The Mystery of Marie Rogêt (1842) and The Purloined Letter (1844). 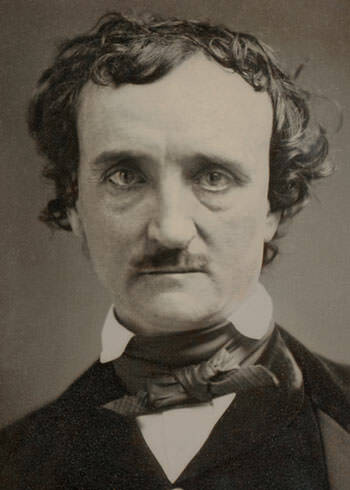 Edgar Allan Poe was one of the first writers to explore the literary genre of science fiction. He composed pioneering tales that captured the scientific developments of the era. His short stories also explore such wide-ranging contemporary themes as galvanism, time travel and resurrection of the dead. For example, his 1835 short story titled The Unparalleled Adventure of One Hans Pfaall relates a man’s balloon journey to the moon. 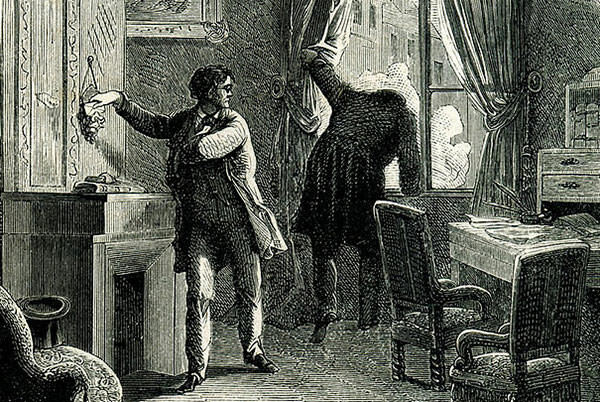 Another Poe science fiction story The Facts in the Case of M. Valdemar is about a mesmerist who puts a man in a suspended hypnotic state at the moment of death. Also some of the ideas he presented in his 1848 work Eureka: A Prose Poem anticipated 20th-century scientific discoveries and theories. Poe was thus one of the first science fiction writers and his work influenced later writer in the genre including Jules Verne. 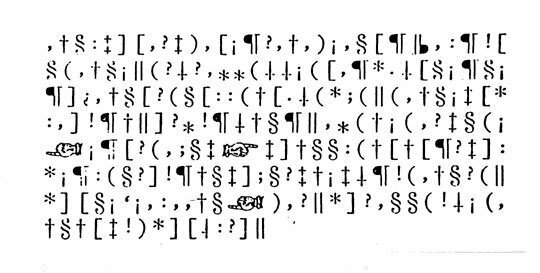 Poe not only had a working knowledge of cryptography, which we see in his story The Gold Bug, but he was himself pretty good at playing with codes. In fact, in 1839, he sent out sent out a call to the readers of Alexander’s Weekly Messenger to send him encoded messages that he would decipher. He would then spend hours trying to unearth their secrets and publish the results in the subsequent issues of the newspaper. Poe was up to the challenge and, between December 1839 and May 1840, he solved all of the ciphers submitted to Alexander’s. This exercise became widely popular. Poe concluded the contest by publishing two additional ciphers, by the name Mr. W. B. Tyler. In 1985, it was suggested that Tyler was in fact Poe himself and this led to the puzzles gathering widespread interest. In 1992, Terence Whalen of the University of Illinois at Chicago was able to solve one of them. Poe is the first recorded person to use the term “short story” (in the year 1840). 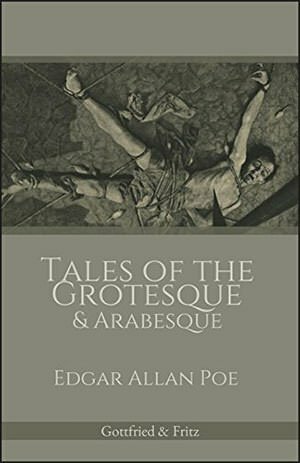 In the preface of an Edgar Allan Poe book titled Tales of the Grotesque and Arabesque, he wrote: “I have written five-and-twenty short stories whose general character may be so briefly defined.” He is also attributed with the coining of the word “tintinnabulation” which he used in his poem The Bells. Poe writes “Keeping time, time, time, In a sort of Runic rhyme, To the tintinnabulation that so musically wells … From the jingling and the tinkling of the bells.” His usage of the word denotes that it was meant to describe the sound made by the ringing of bells. Poe had a rivalry with poet, critic and editor Rufus Wilmot Griswold. Poe had an extremely low opinion of Griswold’s intellect and literary integrity and he thus criticized his work. This rivalry grew when Griswold succeeded Poe as editor of Graham’s Magazine at a higher salary than Poe’s. Following this, Poe openly attacked Griswold in front of audiences. Shortly after Poe died, his image was severely damaged by Rufus Griswold. Griswold took his revenge by painting a false image of Poe, depicting him as a frenzied writer, drunkard and womanizer. In fact, Griswold went to the extent of penning the first biography of Poe. He also somehow became the literary executor of Poe and attempted to completely destroy his reputation. Fortunately with time, many of his claims were revealed to be lies or half-truths. For instance, it was eventually proved that Poe was not a drug addict as claimed by Griswold. 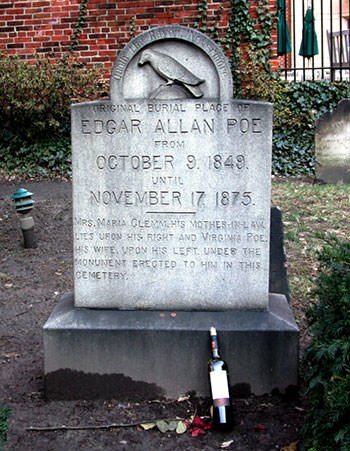 Befitting the mysterious life and death of Poe, his grave attracts another mystery. Dubbed as the Poe Toaster, a mysterious man visited Poe’s grave in the early morning hours of every January 19th, offering three roses and half a bottle of cognac before disappearing. It is said that the man dressed in a black cloak and a white scarf and concealed his identity by covering his face with a wide-brimmed hat. On many occasions, the mysterious figure also left behind certain notes, including a super bowl prediction and comments on the connection between French cognac and the war in Iraq. Oddly so, the Poe Toaster has been absent since 2010. Lizzie Doten, a psychic medium and poet, published her poems in 1863 in a book titled Poems from the Inner Life. In this collection, she included some poems that she claimed to have received from the ghost of Edgar Allan Poe. She claimed to have written these poems by channeling Poe’s spirit. This was an obvious publicity stunt to market her own (possibly mediocre) work. Poe’s fans however were not convinced by this fascinating claim as they believed that the caliber of these poems were not up to the mark of Poe.